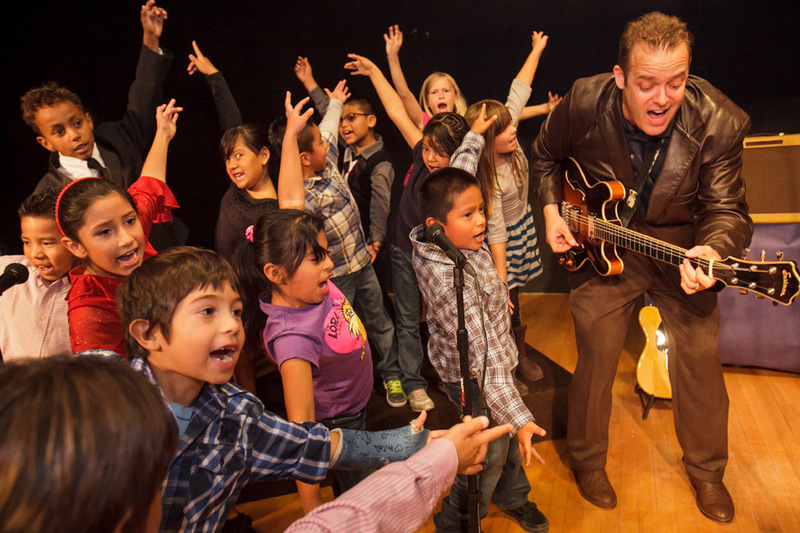 The Kids Like Blues Band is a real live performing band made up of 30 second grade students in Oceanside, CA and their classroom teacher Mr. Jon Schwartz. The kids are regular children doing extraordinary things with music, language arts, the visual and performing arts, technology, and US History. They have 15 blues songs in their repertoire and can play a 35-minute set as a self-contained unit or with an accompanying rhythm section. They have played on TV, at street fairs, talent shows, and college campuses. With their teacher, they’ve made a series of pro quality videos and audio recordings geared towards educators and laypeople. Check out their Video Page. The Kids Like Blues Band has been featured by the US Dept. Of Education, KPBS and a host of other publications for their use of blues music as a thematic teaching tool. They use the lyrics and music as a springboard for teaching academic content standards in reading, writing, listening, speech, social studies, and the visual and performing arts. To watch this all happen click here. As they’re mining the song for opportunities to teach the academic content standards, students choreograph dance moves to the song, learn how to phrase the words correctly and modulate their pitch, tone, intonation, and pronunciation, and work together in an authentic community learning environment to bring each member along as a fully functioning member of their “gigging” band. To see more about how students benefit academically from our work, check out our Frequently Asked Questions Page (FAQ)..